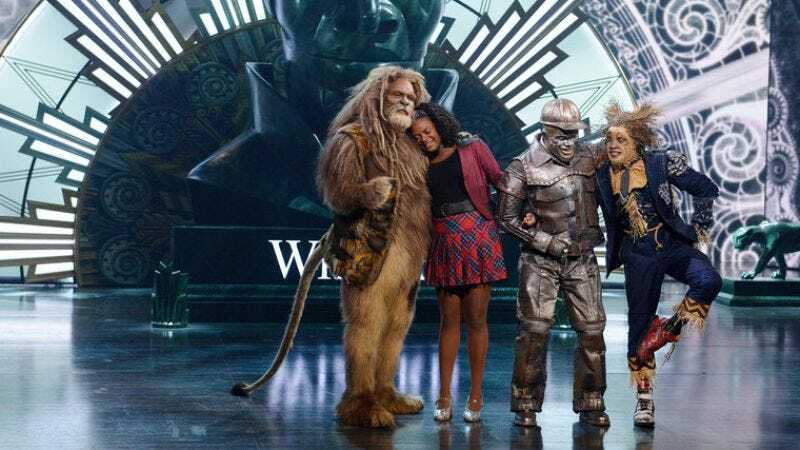 NBC finally gets it right with The Wiz Live! And that’s how you put on a show! The Wiz Live! may be NBC’s third recent attempt at staging a live musical, but it’s the first one that worked without any caveats necessary. I was kinder to The Sound Of Music Live! and Peter Pan Live! than most critics because I felt there was a lot of potential in the idea of staging live musical theater on TV. Tonight NBC proved my faith was well placed with a musical event that was finally worth watching and not just hate-watching. It helps that The Wiz is just better source material for a live production than the past two bloated, old-fashioned musicals. While The Wiz isn’t exactly modern (it opened on Broadway in 1975), its radio-ready score and ever so slightly edgy book (there’s a joke about transporting a minor across state lines!) make it immediately accessible to modern audiences. While the show can be a bit plodding and anticlimactic at times (like, for instance, the Wicked Witch’s quick death), it’s smart enough to throw in an upbeat song every few minutes to keep things easing on down the road. Rather than give audiences a celebrity to root against this year, NBC smartly offered an underdog to root for. Newcomer Shanice Williams is easily the best lead NBC has cast so far, bringing heart and conviction to her modern day Dorothy (dressed in a red plaid miniskirt in place of Judy Garland’s iconic blue gingham). If her acting was sometimes a little low-energy, she more than made up for it each time she opened her mouth to sing. Her Disney princess-like rendition of “Soon As I Get Home” contrasted nicely with her powerful, rich performances of “Be A Lion” and “Home”—two numbers that likely brought tears to many eyes. It would be difficult to overemphasize how much script-doctor Harvey Fierstein has improved upon William F. Brown’s original script, particularly when it comes to the musical’s plucky heroine. Fierstein has created a tight thematic through line for Dorothy that, frankly, all future productions of both The Wiz and The Wizard Of Oz should steal. There’s always been something odd about the tale of a young girl who dreams of adventure, goes on one, and ultimately decides the best way to live life is to never, ever leave home again. Here Fierstein gives Dorothy a tragic backstory that makes “home” an active choice and not a narrative cop-out. That balloon moment is just one of Fierstein’s many smart, subtle changes, including a new element of psychological horror during the “Kalida Battle” in which a shape-shifting monster poses as Dorothy’s dead mother to try to trick her out of her silver slippers—reminding us how much Dorothy has lost at such a young age. And Fierstein gives Dorothy new moments of agency throughout the show, from the way she quickly learns to name-drop her defeat of Evermean as a way to open doors to the brand new song “We Got It” (written by Ne-Yo and Elijah Kelley) that lets her rouse her newfound friends into action. Those scene-stealers include Stephanie Mills, who originated the role of Dorothy on Broadway, and brought the right amount of gravitas to Aunt Em. Elsewhere Glee’s Amber Riley showed off both her stunning vocals and natural stage presence as quirky, self-assured Good Witch Addaperle. My fears that Mary J. Blige would be the Carrie Underwood of this performance (great pipes, wooden acting) were totally unfounded. She actually went in the opposite direction, hamming up the scenes around her big number, which is a perfectly acceptable choice for someone playing the Wicked Witch of the West. Queen Latifah was solid—if a little vocally underwhelming —as both the androgynous, highly-contoured Wiz and the less-put-together woman behind the curtain. And Orange Is The New Black’s Uzo Aduba brought a grounded elegance and earthy conviction to Glinda—whose entrance put that bubble machine from Wicked to shame—in her show-stopping performance of “Believe In Yourself.” Oh, and Common looked nice in his costume, I guess. From a casting point of view, the whole production was an embarrassment of riches—a living embodiment of Viola Davis’ assertion that actors of color are lacking in opportunity, not talent. Elijah Kelley proved his scene-stealing turn in Hairspray was no fluke as the charismatic, back-flipping Scarecrow (who, unfortunately, looked like something out of a particularly creepy Neil Gaiman story). Meanwhile, David Alan Grier provided solid comic timing and surprisingly strong pipes as the Cowardly Lion. And R&B singer Ne-Yo’s Tin Man emerged, appropriately, as the heart of this production. He nearly stole the show with his energetic performance of “Slide Some Oil To Me” and his soulful take on “What Would I Do If I Could Feel.” Even the weird affectation he adopted during his scenes ended up charming me, if only because it showed how much he was trying to throw himself into the role. Unfortunately, The Wiz Live! wasn’t quite as successful with its visuals as it was with its casting. Production designer Derek McLane made the most of several massive LED screens to add depth and dimension to his limited stage, but it’s clear he hadn’t been given the same budget he used to create the gargantuan sets of Peter Pan Live! Thankfully, costume designer Paul Tazewell’s gorgeous candy-colored couture helped distract from the limited scenery. Whereas last year’s show added cinematic flair with an ever-moving camera, The Wiz Live! felt disappointingly static. There were close-ups where there should be wide shots and visa versa, not to mention odd moments where someone delivering a line wasn’t even onscreen. It felt like NBC was struggling to film an existing Broadway show, not documenting a musical that was specifically staged for this broadcast. The camera and stage direction should work in harmony during these productions—as they did during Peter Pan—not feel at odds with one another. Perhaps it was an issue of too many cooks (too many cooks!) in the kitchen. While previous director/choreographer Rob Ashford could control the whole flow of the show, Tony-award winning director Kenny Leon shared movement duties with famed music video choreographer Fatima Robinson as well as Cirque du Soleil—whose much-hyped involvement in the show didn’t end up leaving much of an impression. But even moreso than some problems in presentation, my biggest critique is that NBC really needs to bite the bullet and start filming these things in front of a live audience. Even the best-performed musical numbers (and there were a lot of them tonight) land with a thud when there’s no applause after them. And a bunch of really funny lines (like Evillene’s henchmen admitting he has bad news immediately after her song about how she hates bad news) got lost in the shuffle without a laughing crowd to buoy them up. And while part of this problem is specific to The Wiz, NBC also needs to find a better way to wrap up these musicals—perhaps with an actual curtain call. Really, however, those complaints are fairly minor, especially compared to the much larger issues I had with the past two NBC musicals. It’s a testament to The Wiz Live! that the most people could find to snark about on Twitter was the noticeable lack of Toto during most of the show. Perhaps that’s because this production really did feel like something special. Tonight’s broadcast was full of black actors of all different ages, skin tones, and body types playing characters that ranged from saintly to villainous and everywhere in-between (sometimes all at once: Dorothy is probably the most lovable murderer ever written). The show asserted—often explicitly—that these characters are smart, brave, loving, powerful, and beautiful. White audiences take it for granted how often we’re bolstered up by the media we watch. The Wiz Live! sent the same message to black audiences while simultaneously offering up a goofy, heartwarming piece of entertainment for everyone. In other words, The Wiz Live! had courage, heart, brains, and one of the catchiest musical scores ever written. Really, what more could you ask for? The humor of the munchkin scene would kill in front of a live audience (and this production does have plans to transfer to Broadway), but it came across so flat here. I cannot get over how great Amber Riley was. I always enjoyed her on Glee, but she was on a whole other level here. Personally, I like the Scarecrow’s original number “I Was Born the Day Before Yesterday” better than “You Can’t Win” (which was featured in the movie), but that crow chorus sounded amazing. I loved that weird cat-like thing David Alan Grier did with his mouth. 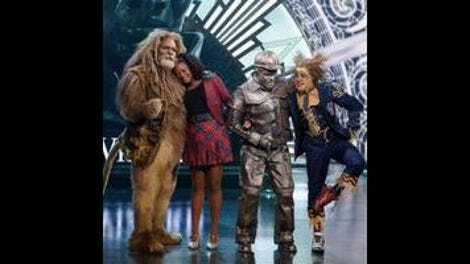 Spice Girls, Eddie Murphy, corporate takeovers, and iPads: Things The Wiz Live! thinks are relevant to modern audiences. Queen Latifah has never looked better than she did in that white coat. I literally gasped when she walked onstage. Dulé Hill should have played Common’s role.